Ninja Course is a brand for obstacle courses that challenge and improve the strength, endurance, coordination, agility and balance of both children and adults. They are a fun activity that allows participants to train, compete and unwind in a safe environment. The Walltopia Ninja Course is a modular construction that allows clients to easily modify the number of lanes and obstacles according to their preference and space available. There is a variety of obstacles with different levels of difficulty available that can challenge a wide audience of participants. A Ninja Course can be a great fit to trampoline parks, FECs, sports centers, training facilities and climbing walls. The Ninja Course modular aluminum structure is a system consisting of square aluminum trusses that are put together to create custom courses. The structure can be expanded in any direction, making the attraction easy to upgrade. Ninja Courses have a starting and finishing platform at the beginning and end of each corridor. There are internal platforms between some obstacles, which are used to transition from one section of the Ninja Course to another. Each starting platform has a sensor mounted on one of its columns, which activates a timer every time a participant crosses the starting line. Each finishing platform has a button that stops the timer, and a tablet that displays the participant's results. Results can be saved and displayed on a monitor. 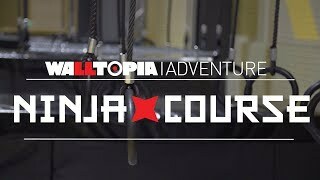 Walltopia has over 45 different Ninja Course obstacles to choose from, each varying in difficulty. The full list can be found here. Each Ninja Course must be equipped with high absorption safety flooring - 1.2/1.5 m inflatable bag for elevated courses, or 20 cm boulder mat plus 3.5 cm carpet bonded mat for ground-based courses. Platforms and columns are secured with 3.5 cm smooth vinyl bonded mat. A safety net surrounds elevated Ninja Courses to prevent participant falls that may lead to injuries. A Ninja Course can have up to three lanes with different levels of difficulty. Courses with more than three lanes can be customly designed. As the name suggests, this type of Ninja Course is positioned on the ground. It is less extreme than the elevated course, but an excellent choice for training purposes. 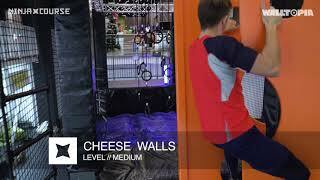 This type of Ninja Course is raised 2.1 meters (7ft) above the ground, making it the more exciting option. If you are looking for an adrenaline-boosting experience, then the elevated course is the way to go, as participants will experience falls from up to 2 meters (6.5 ft). The Parkour Course is a ground-based course with no supporting structure. This makes it an excellent choice for locations with limited space and low ceilings. The Parkour Course lets kids, teens, and adults experience the freedom of movement in a challenging yet safe environment. The multi-level course combines ground-based ninja obstacles with elevated ropes course obstacles. Participants must be harnessed and attached to a belay line in order to enter the ropes course. This option is a great fit for locations with limited ground space and high ceilings. This type of Ninja Course is designed to handle big traffic as its capacity is up to 150 people per hour. How long does it take to manufacture, deliver and install a Ninja Course? The lead time for a standard Ground Base Course and Elevated Course with standard obstacles is 2 weeks. For all other types of Ninja Course is 4-6 weeks. The delivery time depends on which part of the world you want us to transport the course to. Ninja courses can be installed in as little as 1 week. Can I install my own Ninja Course? Yes, ground-based Ninja Courses can be easily installed by the customer. If you choose an elevated course, however, we do recommend having our experienced crew install it for you. Is there a minimum age requirement for using the facility? Ninja Course is recommended for participants who are over 8 years of age. Participants must also be 130 cm or taller. What is the facility’s capacity? It depends on the number of lanes that the course has. A ground-based Ninja Course can have as many as 30 people per hour, per lane. An elevated course’s capacity is about 20 people per hour, per lane. What is the minimum height for an elevated Ninja Course? The minimum column height for an elevated Ninja Course is 4.5 meters.